Even fancy grocery stores have humble, bargain ingredients. Case in point, smoked ham hocks were on special at our local Gelson’s, where the parking lot is littered with high end cars. Apparently, even the staff has swanky rides. The ham and veggie base, browning nicely. Meatloaf is hard to do really badly, as long as you follow a few basics. My rule of thumb for getting the texture right is that all the ingredients, once assembled, should have the consistency of stiff cookie dough. 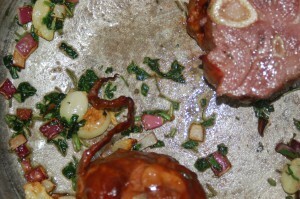 Another tip is to make sure you have a mix of meats. 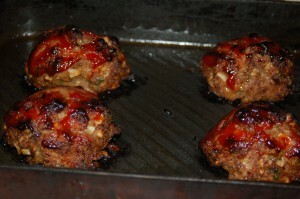 Plain ground hamburger, or plain ground turkey, will cook up too dry. 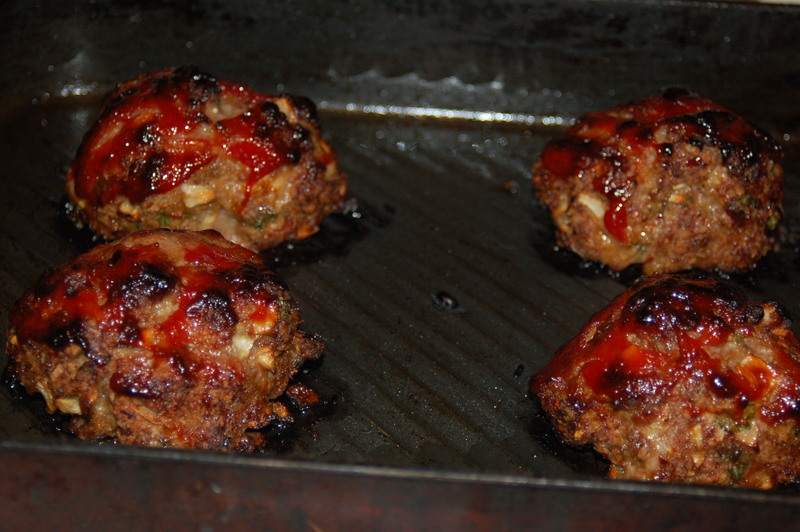 If you are a very disciplined non meat eater, who wants a ground turkey loaf with no secret pork added, I have some tips at the end of the recipe. For this recipe, I combine pre-made pork sausage and beef, which is easier than buying ground veal, ground pork and beef and then mixing. 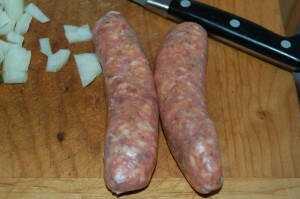 2 uncooked Italian pork sausages, hot or sweet (non spicy) . I use one of each. You can take the spice up or down to preference. Uncooked pork sausages are the secret. Put the beef in a bowl. Slice open the uncooked sausages and turn the mixture into the beef. I’ve seen tv chefs try to squeeze the sausage out like toothpaste. It’s easier to slice it open, believe me. 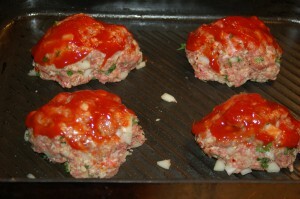 Add the chopped red pepper and onion – I use a mini chopper as it is almost pureed and very wet. This moistens the meatloaf as it cooks. Add the egg, cumin and worcestershire. If you hate cumin, you can add in a couple tablespoons of fresh chopped parsley. If dried, just a teaspoon. I add the bread crumbs last, as the mixture is not always as wet or dry as I expect, so I put it in a bit at a time, to get the “tightness” I want. Miniloaves formed, coated in ketchup. Now I get out a flat baking pan with at least a one inch rim and shape it into equal mini loaves, as everyone wants a crusty end, and there are only two if you put it in a regular loaf pan. I then squeeze ketchup over each one, making a “shell”, and I sprinkle brown sugar over the ketchup and kind of press it in. Bake this at 425 degrees for 20 minutes, then turn it down to 325 for an additional 35 minutes or so. You know your oven. Notes for using ground turkey: double the onion and pepper and double the worcestershire. Omit the cumin and use fresh chopped parsley. I don’t do the ketchup topping on this as it is not really complementary to the poultry flavor. Try it anyway, it may work for you. You need to leave the turkey at high heat longer as it needs to “cook out”. Nobody needs undercooked turkey! We like the burned bits you get from the brown sugar melting down. We eat it with a big salad and a side of pan roasted broccoli and garlic in olive oil. I went on a top secret Valentine’s gift mission to Santa Monica a couple days ago. Yes, we have a splendid fancy mall here, and a couple of indy type shops where you can get odd gifts. There is even an elderly engraver along the main drag, 85 if he is a day, in a tiny store with about 11 products right out of Dickens. The roof leaks when it rains, but buckets are strategically placed, and he shares one wall with a meat smoking joint and another wall with a tire shop. Sorry Mr. Man From Another Time, the west side of L.A. still rules for quirky sole proprietor shops with hard-to-find merchandise. So I found something the (no name, please) shop posted on the internet, emailed them to hold it for my perusal and took a typical SoCal three freeway drive to see it. In parts of Europe, I’d have crossed a couple of borders making the trek. I parked in one of the public structures where I could get 2 hours of free parking, enough time for my errand and maybe a snack. When I lived in Santa Monica, February meant a turtleneck against foggy weather, so I wore one. Saturday it was an unreal 80 degrees. I stopped at Gap to buy a t shirt lest I melt. Right nearby was an inviting little storefront promising small bites and an extensive wine list. It was called The Misfit. And you thought the title of the article was about me? Trust me, I’m pretty mainstream. Outside the joint, people in yoga clothes (really fit people, looking perfect) lounged. Maybe all the small bites involved yogurt? Looked at the menu. There was kale, but also skinny fries. There were tons of fresh made cocktails (not for a three freeway drive day, sadly), and ribs, and fresh dips and. . . all right I’d stop in before going home. 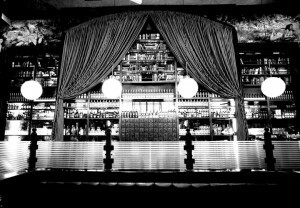 The awesome bar, seemingly shot with old school high speed black and white film with a long exposure. It’s cozy inside, not eery, I swear. The 3rd street Promenade is an open air mall which is car free. The only traffic is human. You simply can’t go 20 yards without overhearing strolling tourists with international accents and seeing street musicians, comedy acts and today, a fire and brimstone preacher. Penn and Teller paid their dues down on the Venice Boardwalk and the dream indeed is still alive. Lotsa hope down there. Not so for the “psychic” Irish tea leaf reader, dressed in too much green velvet, who looked seriously cranky. Maybe it was the boy band near her. I mean boy. I mean 10 years old, loud and doing covers of songs much older than their parents. They had guts, anyway. Stopped in to the shop, examined, totally changed my mind about what to buy, and headed back to the car. I sat at the bar and got an immediate menu from someone cheerful, then ordered and almost immediately got roasted chicken and kale soup ($6). Water (free). Watched the bartender make their homemade sangria with white wine and fresh fruit. Eye wandered over the decor, which included a collection of vintage cocktail shakers, vintage decorative only stereo speakers straight from my teen years. (JBL). Younger readers will say: what’s a stereo? what’s a JBL? why would a speaker be 18 inches long? Ask your grandpa. In keeping with retro decor was retro food in all the right way. No premade broth that I could detect. Nothing from the restaurant supply Cisco truck. Neat wine list. Decent prices. I cracked and ordered the hand cut fresh made skinny fries. Half order $3. You could taste the beef fat they were finish fried in (all the rage lately) but they needed salt. Had the yoga crowd quietly protested with deep looks and sighs? Why would beef fat be okay but not salt? A misstep corrected by asking for a salt shaker, delivered basically, yes, immediately. I finished up, nosed around. The kitchen is upstairs with an open window you can see into (not hiding much). 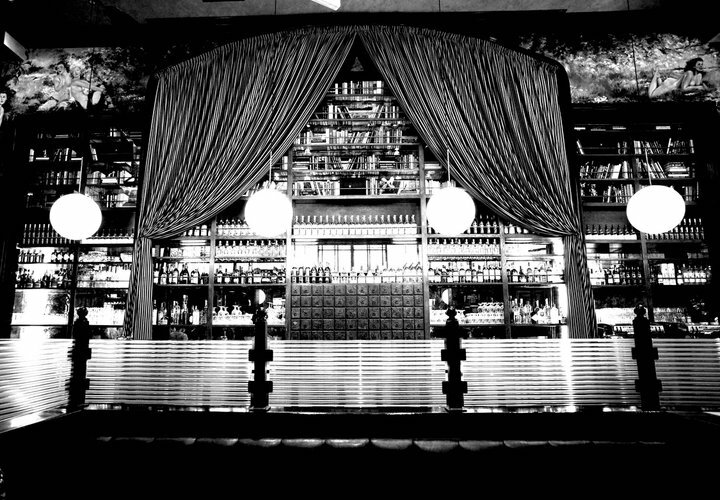 The wait staff gets the added bonus of cardio all day and night with the Parisian-style restaurant stairs. Great service, reasonable menu, busy but friendly. Such a find. What magic alchemy of financing, staffing and sourcing made this happen? I research it. It’s owned by a mini restaurant group from Phoenix who does this kind of thing. They have a couple places in Pasadena. So unicorns and the magic restaurant fairy were not involved. Pros who train their staff really well were behind the magic, for a change. Yay. I’ve now read like 300 raves and near raves on yelp, and learned I completely missed getting their salted chocolate chip cookies to go (6 for $3). You know what? I like a place you find without yelp or the internet, and learning about it later. But this does explain why the busy staff was surprised when I looked like a greenhorn at the menu, was curious at the decor and displayed no “please me, I expect the moon” behavior . Go. We’ll meet for cookies and cocktails. It’s at 225 Santa Monica Blvd., Santa Monica, CA 90401, and the public garage across from the Laemmle theater is really close. We’ll go early. Happy hour is noon to 7 every day.